Matcha has taken the health world by storm. Reap the benefits of this antioxidant powerhouse with this deliciously smooth and creamy smoothie. Tea time has never tasted to good! Stir matcha powder into hot water. When well-mixed, allow to cool slightly, then add to a blender with the rest of the ingredients. Blend until smooth and frothy. Enjoy! 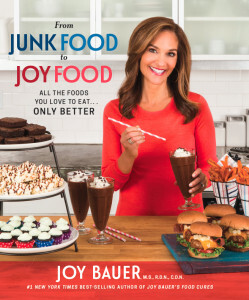 For more healthy recipes, check out Joy’s new book, From Junk Food to Joy Food! Order here.